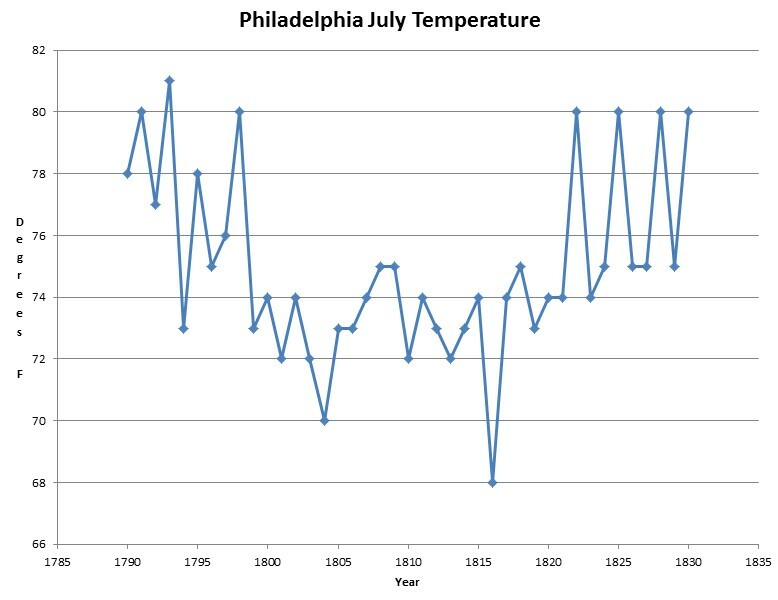 From 1790 to 1804, Philadelphia July temperatures dropped almost eight degrees. So far this month, Philadelphia temperatures have averaged 79F. Thirty years from now, alarmists will be saying that 50 years with no warming isn’t long enough. This week had to break some cold records ala the spin on heat records NOAA makes. For example, it had to be the coldest Tuesday to Monday between July 23 and July 29 in history or something. Because it’s freezing in the entire east coast and midwest. It was 59 yesterday in northern Indiana. 59! St. Louis set a new record low of 56, the previous record was 59. And BTW, the record high was 108, set in 1930. Let’s hope that by then they’re using their own money to do it rather than tax dollars. It will be fun to watch the catastropharians try to spin a 3 C fall in temperature. The current solar cycle SC24 is tracking SC5 very closely. Not Maunderesque yet, but there are some signs that SC25 may be cooler even than SC6.